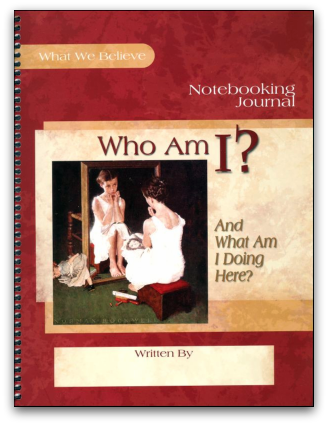 You are here: Home / Apologetics / TOS Review: Apologia ~ Who Am I? And What Am I Doing Here? 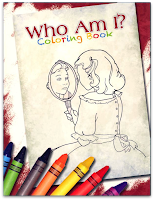 TOS Review: Apologia ~ Who Am I? And What Am I Doing Here? A recent nationwide survey completed by the Barna Research Group determined that only 4 percent of Americans had a biblical worldview. When George Barna looked at the “born- again” believers in America, he found that a mere 9 percent had a biblical worldview. We all have some kind of worldview . . . whether biblical or secular, and it is affected by many factors — our culture, our upbrining, our education, TV, music, movies. Most of us wander through life having never really considered defining exactly how we view the world, from what lens we are peering. Because our worldview shapes our moral fiber and how we act, it’s a bit scary to me that so many Christians are developing a more secular (pagan) worldview. Because that’s what it is . . . if it’s not biblical, it is pagan. Helping to guide my son toward a biblical worldview is important to me. Since the Bible is THE foundation of truth, it is where we should begin building. That’s where the folks at Apologia have begun with their apologetics curriculum, What We Believe. 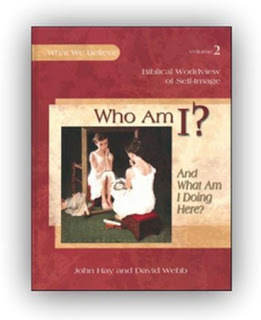 We were already familiar with this series having begun the Who Is God? And Can I Really Know Him? curriculum earlier this year. So when we were sent the second set in the series, Who Am I? And What Am I Doing Here?, for review, I was thrilled. Who Am I? is a biblical study focusing on the biblical worldview of self image. Our children are bombarded daily with messages about who God is and who they are. The messages are mixed, and often negative. The rates of drug and alcohol abuse, teen pregnancy, suicide, and children growing up in “the church” only to disavow and leave as teenagers is growing at a steady rate. It is imperative that we instill in our children a healthy self-image, one in which they know that they know that they are created in the image of God, and for his glory. This series from Apologia will help you do just that. How will you run the race? What kind of fruit are you growing? Each lesson is structured similarly, beginning with the main topic, followed by a short story (featuring characters your children’s ages), and continuing with thought-provoking questions, important vocabulary words, memory verses, topics related to the main text, discussion of Godly character traits, prayer, and the study of other worldviews. Living in the U. S. means we are exposed to many other worldviews, and Ben and I found this part very interesting. Some of the differing worldviews discussed include Mormon, Islam, Hindu, atheist, and New Age. These discussions are presented from the point of view of children being raised in a different culture, with a different worldview. 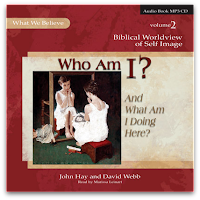 This section, and the discussion questions which follow, will allow you and your student to learn why people believe what they do and how each worldview differs from your own. The text is written to the student in a very conversational style. Your older students can complete the study independently, while your younger students will enjoy working through it with you. Although Ben is perfectly capable of completing it alone, I do work through it with him. Much conversation is sparked and I really don’t want to miss out on that. The text is very meaty. This is not your ordinary, every day Bible devotional for kids. Ben and I spend about an hour a day with this study, covering one lesson about every 2 weeks on average. Along with the main text book (260+ pages) we were sent the spiral bound Notebooking Journal, Coloring book, and audio CD. The CD is an audio recording of the entire book. It is an MP3-CD, meaning it will only play on your computer or an MP3-compatible CD player. Ben enjoyed coloring in the coloring book while I read aloud to him, or while listening to the CD (he prefers listening to me). We used the Notebooking Journal daily to record his thoughts and vocabulary. There are also fun activities, such as word finds and crossword puzzles peppered throughout. We LOVE the Notebooking Journal. While none of these items are mandatory to use with the book, I highly recommend purchasing the Notebooking Journal, especially for students 3rd grade and older. Overall, we are very excited to have discovered this resource. Having the Bible and a biblical worldview as the foundation of our lives is paramount. The What We Believe series is an engaging, fun, and solid way to teach truth to your children. I love having this tool to help me disciple my son. It is an amazing thing to have worldview conversations with an 11-year-old. He is so much farther ahead of where I was at his age (and older). Watching what is happening within his heart, as we work through these books, is a sight to behold. I have tremendous hope for his future as a faithful, compassionate man of God. Who Am I? $39 See sample pages and the Table of Contents. Who Am I? 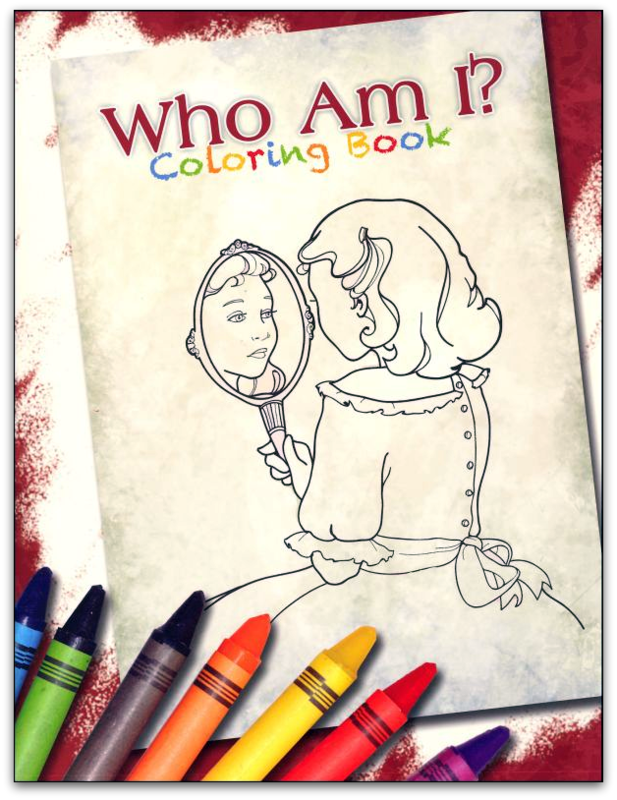 Coloring Book $8 See sample page. A very grateful thank you to Apologia for letting us review this awesome set! To see what other members of the TOS Crew thought about Who Am I?, click over to the Crew Blog. « Lapbooks and Unit Studies and Printables . . . oh my!